The late Professor Bongani Mayosi (file photo). 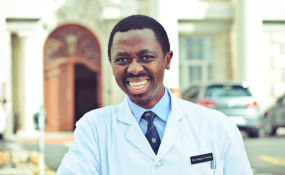 Professor Bongani Mayosi, the dean of the University of Cape Town (UCT) Faculty of Health Sciences and an A-rated researcher, died on Friday. It is with great sadness that we, the Mayosi family announce the passing of our husband, son, father, brother and uncle, Bongani Mayosi. Bongani died on the morning of 27 July 2018. In the last two years he has battled with depression and on that day took the desperate decision to end his life. We are still struggling to come to terms with this devastating loss. Kindly respect our wishes as the family that beyond this statement, we will not discuss or entertain any further questions on this matter. We ask that you understand our need for privacy during this difficult time. Mayosi became dean in September 2016, nearly two years ago. It is a promotion that most scientists dread, because it means much less time for the research they love doing and much more time on administration and navigating the politics of academia. Mayosi took over the deanship during one of the most divided and difficult periods in UCT's history, as the Fallist protests escalated. Mayosi's 2015 CV says he has been published in more than 168 peer-reviewed journals. A search for his publications on scholar.google.com affirms his impressive output. Examples are the design of a clinical trial to test a treatment for a complication of tuberculosis that affects the heart; mortality caused by this complication; a review of the burden of non-communicable diseases in Africa; a fascinating commentary on a paper published in the 1950s on heart disease in Uganda in which Mayosi raises concerns about the rate of progress since then in preventing the disease; a number of articles on rheumatic heart disease - his main research interest; and an easy-to-read article on the first black doctors in South Africa. After Mayosi became dean, there are no more first-authored articles. He is the last author on several articles, suggesting that he found time to advise and review the work of up-and-coming researchers. But there was likely no time or energy for him to do what scientists love most in their work - research. About 6,000 people take their own lives in South Africa annually. Most adults in South Africa are likely to know of someone who has died this way, often a family member or close friend. Unless it is a considered, planned and discussed decision made because of an irreversible decline in health, it is one of the hardest types of death to come to terms with. We ponder the desperation and sadness of the person who has done it, and wonder what we could have done to prevent it. It's intractability coupled with the immense grief that follows makes it taboo. Usually, suicide is talked about in hushed voices, and the confirmation that this was the cause of death remains within families, even though everyone outside the family knows it happened. The Mayosi family's statement helps break down the taboo. Their openness will cause people to talk about taking one's own life, its causes, and what we can do to prevent it or at least cope better when it happens. Their acknowledgement that Professor Mayosi was depressed helps destigmatise an illness about which there should be no shame.